Left ventricular (LV) myxoma is very rare, particularly in infants. Surgical management is particularly challenging. We report a case of LV myxoma in a five-month-old infant, which was removed surgically using a unique approach. A five-month-old male infant presented with incidental detection of a murmur during an evaluation for upper respiratory tract infection. The child was otherwise symptom-free, with normal growth and development. The examination revealed normal pulse volume and blood pressure. There was no tachypnea. Auscultation of the heart revealed an ejection systolic murmur in the left third intercostal space, radiating to the right second intercostal space. The chest roentgenogram was normal. The child was in sinus rhythm with no echocardiographic (EKG) evidence of LV hypertrophy. 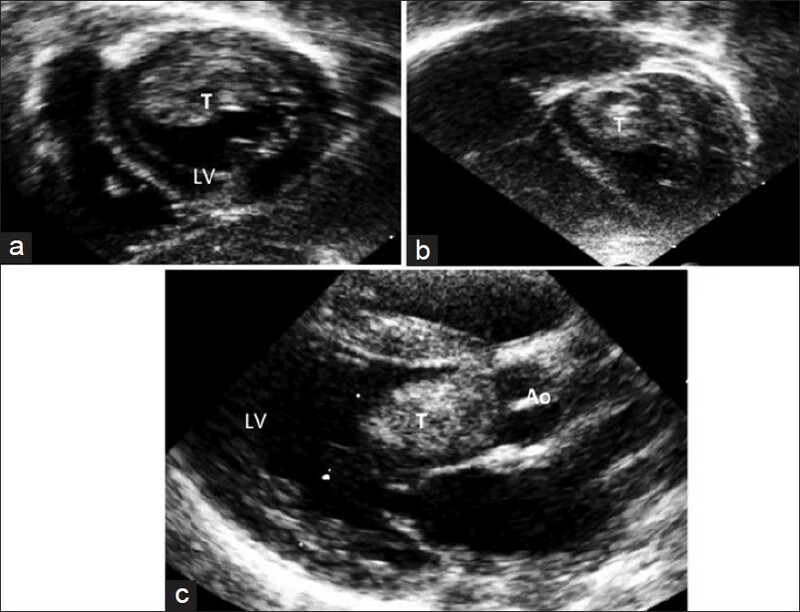 Transthoracic echocardiography revealed a single tumor mass, with varying echo density, which was 20 mm in its largest dimension, protruding in and out of the left ventricular outflow tract causing significant outflow tract obstruction [Figure 1]. The tumor was arising from the anterior, lateral, and superior aspect involving the lateral papillary muscles. Three-dimensional echocardiography demonstrated an irregular surface [Figure 2]. The Doppler revealed a peak gradient of 88 mmHg across the left ventricular outflow tract. There was no mitral stenosis, mitral regurgitation or aortic regurgitation. The left ventricular function was normal. Through a midline sternotomy and under cardiopulmonary bypass, the aorta was clamped and the left atrium was opened in the Sondergaards plane. A vent was introduced and a mitral valve retracted. The tumor was not visualized well from the left atrium. An aortotomy revealed that the tumor was found fully occluding the left ventricular outflow, extending to just below the aortic valve. It was not possible to define the tumor margins and tissue planes completely from the aortotomy. A decision was then made to access the LV via the conal septum. The right ventricle (RV) outflow was opened and the conal septum was incised (like in a modified Konno operation) and retracted. The tumor was visualized and removed from the superior, lateral, and anterior wall of the LV. Some tumor was left alone in the region of the lateral papillary muscle, as removing it would have damaged the papillary muscle. The tumor on gross appearance was a grayish white tissue with a thin capsule, measuring about 20 × 15 × 8 mm. 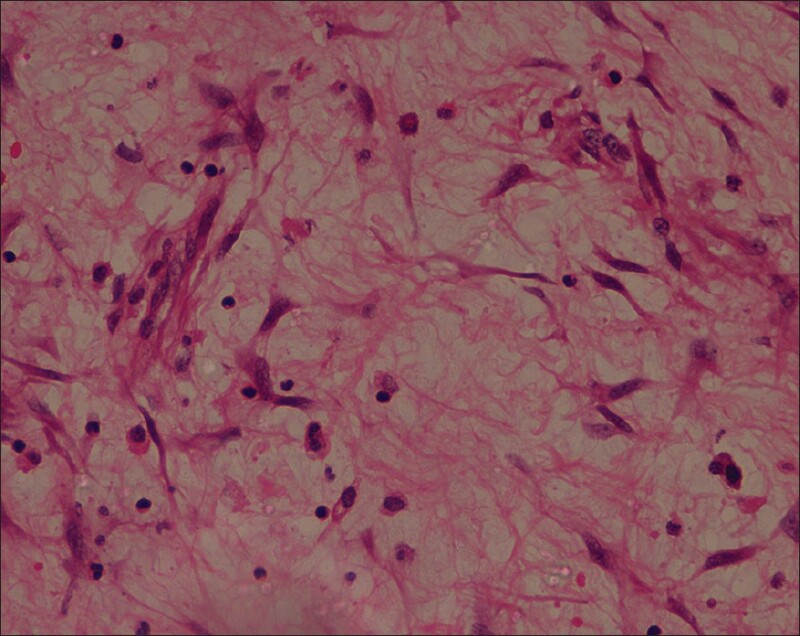 The histological sections showed a neoplasm with spindle cells having round-to-elongated nuclei, with a vesicular chromatin, and oval-to-elongated spidery cytoplasmic processes, set in a myxoid stroma, along with large areas of hemorrhage, suggestive of a myxoma [Figure 3]. The child was noted to have a complete heart block in the immediate postoperative period that reverted to sinus rhythm spontaneously after - eight days. A pre-discharge echo showed normal ventricular function and a small residual tumor mass in the vicinity of the papillary muscle. At the three-month follow-up there was no increase in the size of the residual tumor. At the six-month follow-up, the child was noted to have a prolonged PR interval, wide QRS interval, and an intermittent Wenckebach phenomenon, on a 24 hour Holter recording. In view of the rhythm abnormality and associated history of the previous transient postoperative complete heart block a permanent pacemaker was inserted into an abdominal pocket. An epicardial lead was used. There was no tumor recurrence at the nine-month follow-up visit. Very few cases of ventricular myxomas have been reported in children. There are no reports of left ventricular myxomas in infancy to the best of our knowledge. Due to the location of the tumor, it could not be approached either through the mitral valve or through aortotomy. Hence, the tumor had to be approached through the conal septum. The tumor mass could be accessed through this technique, but this resulted in a transient complete heart block in the immediate postoperative period and eventually a permanent pacemaker was needed. Complete surgical excision of the tumor, with adjacent tissue, is recommended. In this infant we could not completely excise the tumor, as the tumor involved the lateral papillary muscle. In another similar case report, a 32-year-old was reported to have LV myxoma, with atypical involvement of the subvalvular mitral apparatus, hence, the tumor was treated with surgical excision, but the mitral valve could not be preserved. Considering the age of the child in our case, radical excision of the tumor mass was not done. Nine months post surgery; there was no increase in the size of the residual tumor, with a competent mitral valve. Continued close follow up is mandated, because of the possibility of a recurrence of the tumor. The authors wish to acknowledge the contributions from the Department of Pathology at the Amrita Institute of Medical Sciences, and Dr. CC Kartha from the Rajiv Gandhi Center for Biotechnology, Thiruvanathapuram. 1. Alfieri O, Sandrelli L, Pardini A, Fucci C, Zogno M, Ferrari M, et al. Optimal exposure of the mitral valve through an extended vertical transeptal approach. Eur J Cardiothorac Surg 1991;5:294-8. 2. Caldarone CA, Van Natta TL, Frazer JR, Behrendt DM. The modified Konno procedure for complex left ventricular outflow tract obstruction. Ann Thorac Surg 2003;75:147-51. 3. Reynen K. Cardiac myxomas. N Engl J Med 1995;333:1610-7. 4. Lam KY, Dickens P, Chan AC. Tumors of the heart. A 20-year experience with a review of 12,485 consecutive autopsies. Arch Pathol Lab Med 1993;117:1027-31. 5. Beghetti M, Gow RM, Haney I, Mawson J, Williams WG, Freedom RM. Pediatric primary benign cardiac tumors: A 15-year review. Am Heart J 1997;134:1107-14. 6. Lijoi A, Scoti P, Faveto C, Canale C, Parodi E, Passerone GC, et al. Surgical management of intracardiac myxomas. A 16-year experience. Texas Heart Inst J 1993;20:231-4. 7. Talmor D, Caspi J, Feuering S, Zuker N, Zalstein E, Ganiel A, Appelbaum A. Surgical treatment of right ventricular myxoma in infancy. Ann Thorac Surg 1996;61:1835-6. 8. Hassana J, Smith M. Robotic assisted excision of a left ventricular Myxoma. Interact Cardiovasc Thorac Surg 2012;14:113-4. 9. Schowengerdt KO, Rahimi B, Tinker K, Flore AC. Hybrid procedure for obstructive neonatal left ventricular tumors. Ann Thorac Surg 2010;90:2057-9. 10. Robert J, Brack M, Hottinger S, Kadner A, Baur HR. 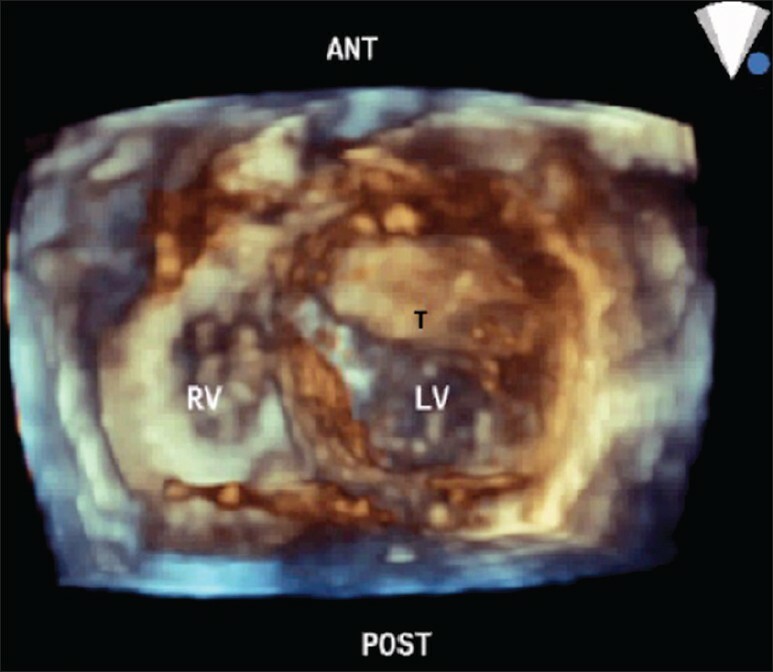 A rare case of left ventricular cardiac myxoma with obstruction of the left ventricular outflow tract and atypical involvement of the mitral valve. Eur J Echocardiogr 2009;10:593-5.